Added by Bill Bowman on January 16, 2019. Rabbi Eli Garfinkel of Temple Beth El, center, speaks while Franklin Township Interfaith Council president Alex Kharazi, right and the Rev. Ann Kansfield, left, look on. 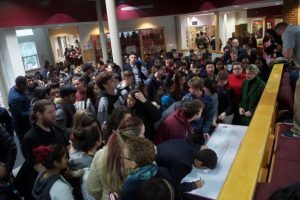 Hundreds of Rutgers Preparatory School students, faculty and administrators on Jan. 16 took a pledge to “Stand up for the Other’ after attending a program on racism and hatred keynoted by state Attorney General Gurbir Grewal. The program was attended by RPS middle and upper schools’ students. The pledge, created by New Jersey Interfaith Advisory Council president Ali Chaudry, has made its way through township schools and government and calls on those taking it to stand up to bigotry and hate. At Rutgers Prep, the pledge was the capstone of a day of speakers and discussions organized by the school’s Advocates for Inclusion in Diversity group, which is comprised of teachers “who are committed to providing programming for students, parents, and teachers in support of inclusion and diversity,” according to a press release about the event. “With the divisive rhetoric, hate speech, and unacceptable violence rooted in social injustice that surrounds us and our students, AID wants to call attention to the importance of taking care of community in general and the Rutgers Preparatory School community in specific,” the release said. The pledge reads as follows: While interacting with members of my own faith, or ethnic, or gender community, or with others, if I hear hateful comments from anyone about members of any other community, I pledge to stand up for the other and speak up to challenge bigotry in any form. After reciting the pledge, students signed a large poster with the pledge inscribed on it. 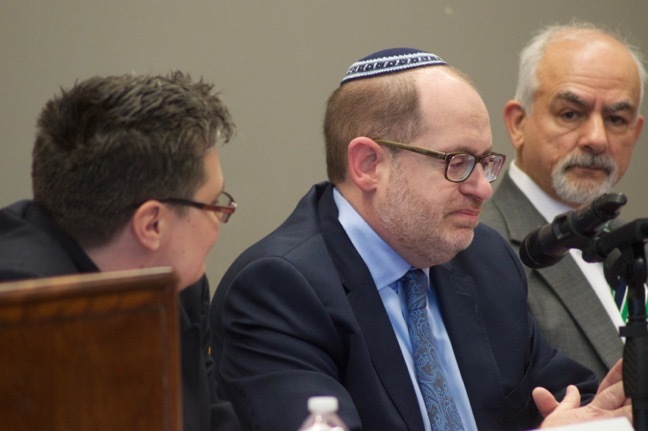 Among those appearing at the dais during the program were Rabbi Eli Garfinkel of Temple Beth El on Hamilton Street and Alex Kharazi, president of the Franklin Township Interfaith Council and a founder of Masjid-e-Ali on Cedar Grove Lane. Also on the dais were the Rev. Ann Kansfield, a 1994 RPS graduate, who is with Greenpoint Church in Brooklyn, N.Y. and Harinder Singh, the founder of the Sikh Research Institute. Kharazi has been bringing the pledge to various groups around Franklin, including the Township Council. The pledge was recited by all township students during concurrent events in 2016. 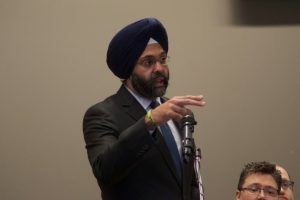 State Attorney General Gurbir S. Grewal speaks during the program. In his comments, Grewal urged the students to “continue to spread the message” of standing up to hate and bigotry. “It always helps to know there are others standing beside you and you don’t have to face these acts of intolerance alone,” he said. Kharazi, an Iranian native, said that he did not experience bigotry in his native country, although he was bullied in high school by a student who was bigger than he. The trend to live solitary lives with the advent of technology and social media weakens communities, which can lead to racism, Garfinkel told the students. “So many of our social problems are connected with the weakening of our communities,” he said. People who want to do something about hate and racism must work to restore “communal bonds,” Garfinkel said. “Most of all, do something loving and kind,” he said. Students lined up to sign the pledge after reciting it. Kansfield, who is also a New York City Fire Department Chaplain, said that as a child she took a similar pledge. “My experience in taking that pledge was a moment in time that I could not unravel,” she said. “Figure out what is that one cause or issue that you’re going to champion,” he said.